Koorosh Daneshgar CEO/Chief Designer and Founder of Wedding Bands & Co.
Koorosh Daneshgar master jewelry designer has three decades of professional experience in creating magnificent fine jewelry. His personal goal is to take his client's stories and immortalize them in the ultimate symbols of love--their precious jewelry. The founding of Wedding Bands & Co. 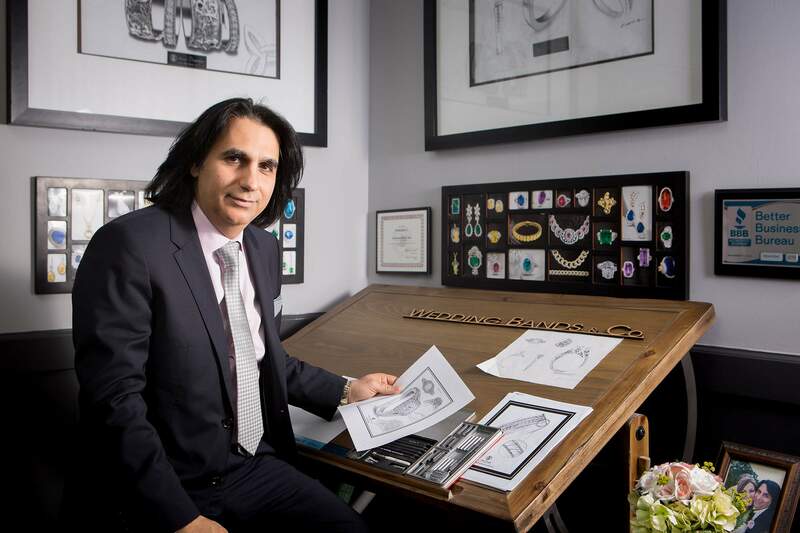 In 1999, when Koorosh Daneshgar formed Wedding Bands & Co. (WBC™), he hoped for success to support his young family by making fine jewelry in his small bench shop in the world- renowned Mallers Jewelers Center in Chicago, Illinois. He achieved that success rapidly, serving all distribution levels of the jewelry trade. He is self-taught and driven by his love of jewelry, his love of family and his passion to succeed. Since 1999, Wedding Bands & Co. has (three times) moved to larger quarters in the epicenter of the Midwest jewelry trade--Jeweler's Row. Today, Wedding Bands & Co is located at 2 North Wabash Avenue, Chicago IL 60602, just steps from Millennium Park. 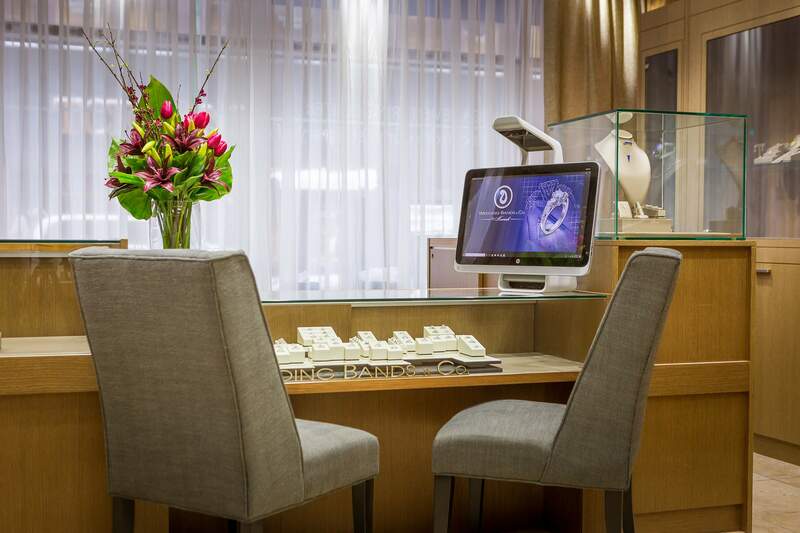 It is one of the largest diamond stores and service jewelers in the loop with a spacious fine-jewelry showroom, executive offices, design department, diamond library, and fully equipped casting/finishing/gemstone-setting facilities, making Wedding Bands & Co. a one stop shop for fine jewelry. One by one, Koorosh Daneshgar CEO/Master Designer and Founder of Wedding Bands & Co. recruited his gifted team of jewelry artisans and gemologists. You can meet them here. Our skilled staff stands ready to help you along this road, ensuring our clients an unmatched jewelry experience. From the beginning, beauty and artwork has surrounded me. I am from the inspiring city of Isfahan, a place that many artists have called home and consider the center for the arts in Iran. I had the great opportunity to start my career as an apprentice to a master jeweler when I was 17 years old. I learned many techniques during my apprenticeship, but truly I wanted to take my future into my own hands. In a few short years, I started my own business and ventured forth on a journey of learning that I am still following today. I have always considered myself ahead of the curve with learning new technology like CAD (even before our competitors), but by also staying true to what I love--the artistry of design. I love to create jewelry of any kind, but my specialty always has been engagement rings. I feel deeply honored. Every design is special to me. But recently, it struck home at a very personal level, as I designed the engagement ring for Sandra, the woman I love, who is now my wife. That experience brought together everything that’s most important to me – professionally and personally – and filled me with gratitude for the work I’m privileged to do, every single day. When I design, I think deeply about what this ring will symbolize. It must be beautiful (and comfortable) enough to be part of my client’s life, for a lifetime. I am proud, humbled, and exhilarated by this trust and challenge. It’s the very best part of my job. If you would like to make an appointment, please let us know when you would like to stop in as well as any specific details you would like to share.